Body Percussion is a practice that can be used, among other purposes, as a sound and music resource. In the past 10 years, more attention has been directed to the types of existing techniques and to those which are still being developed. In many cultures, we can observe the presence of body percussion as a sound or music resource. In each place, it is developed into a specific style and, as we analyze its type and level of complexity, we can even identify dialogues with its cultural context. Percussion, in general, is a practice very associated with popular cultures, and the body percussion follows the same path. In popular culture activities, dance and music are almost always together, and in these environments we can find many kinds of body percussion. When I started writing this article, I intended to provide examples of body percussion techniques that were used in music only, but I noticed that when examples were identified, the dance was so involved that in some cases it would be difficult to distinguish what was dance and what was music. Then, I ended up listing practices that use body percussion as a sound and music resource, not necessarily just in music, and that encompassed more possibilities. It is important to remember that I’m not only going to list body percussion techniques and percussive dance styles, but also that I’ll keep talking about the scenic presentation and performance, and will not touch areas such as music therapy, group dynamics, music education and many others which make the use of percussing the body. I tried to look for techniques that have already some kind of tradition, solo artists will probably be listed in another article. You probably have seen some of these examples isolated, but creating relations between them can be a different way of looking. And this one is just an introduction. Of course there is a lot more to cover . This is just a beginning. Here we have, according the my personal choice, some of most significant names and styles of the body percussion field, within the international field. This is a superficial look, but I tried to explain the origin, the sounds and I put a video giving an example. Technically, I considered body percussion the techniques that hit parts of the body, either on each other or on the floor. BARBATUQUES, besides being the name of the group, nowadays it became the name of its own technique, initially developed and crafted by Fernando Barbosa (“Barba”), creator and director of the group. The technique began to be researched from the transposition of the sounds of the drum kit to the body, and unfolded in a survey of very sensitive levels and variety of body sounds, from percussive to vocal. HAMBONE (Juba Dance) is a rhythmic dance style, invented by african-american slaves who could not use any type of music instrument. by the fact that some slaves could communicate through drum percussion, slave traders banned any kind of instrument, which ended up stimulating them to use their own body. In this technique, light slaps on the chest, thighs and legs are combined with feet and hand hits. CLOGGING is a rhythmic dance style originated during the Industrial Revolution in the United Kingdom. Clog is the type of shoe used at the time by millions of industrial workers in the cities, and this is why this style can be considered one of the first urban dances. In Clogging, there are basically either shoe hits on each other or on the floor. This technique used to be used as entertainment, accompanied by songs, and influenced the creation of the Juba Dance and the American Tap Dance. TAP DANCE (american tap) is a style of dance that uses the percussion of shoes on the floor to create rhythmic phrases. This technique cam from a junction of three lines of dance: Clogging, Irish Step Dance and Juba Dance. In this style, there are styles more played and styles more danced. The more danced styles approach the musical theater Broadway style, and the more played styles approach the jazz (music style). In tap, the most played body parts are the feet, followed by some possible clapping. GUMBOOT is a dance style that uses body percussion and had its origin in the gold mines of South Africa. In this case, the body percussion technique was initially developed as a communication tool between the miners, who were prohibited to speak. At first, using rhythmic phrases, clapping hands on the rubber boots, they developed a communication language inside the mines, and this practice was later converted into a style of dance among the miners themselves. STEPPING is a line of percussive dance, crated by african-american fraternity college students by 1900. this practice uses steps, claps and “spoken word” to produce a rhythmic combinataion of these elements and, in the body percussion universe, demonstrates an interesting way of combining sounds with movements. STOMP, besides being the name of the english group which works with percussion in movement, can also be considered a genre of body percussion. Among unconventional percussion instruments, the group also explores the percussion of the body. The show also has scenic qualities, exploring not only music but also characters and movement, and the most used body parts are feet, claps and thighs. FLAMENCO (dance) was developed in Andalusia (spain), strongly influenced be Romanian Gypsies who migrated to Spain. Flamenco is a combination of music, song and dance. In its dance, there are slaps on the body, but the main characteristic is the presence of clapping and rhythmic phrases of tap. Musically speaking, its main time signature is 12, with unconventional accents for western ears. 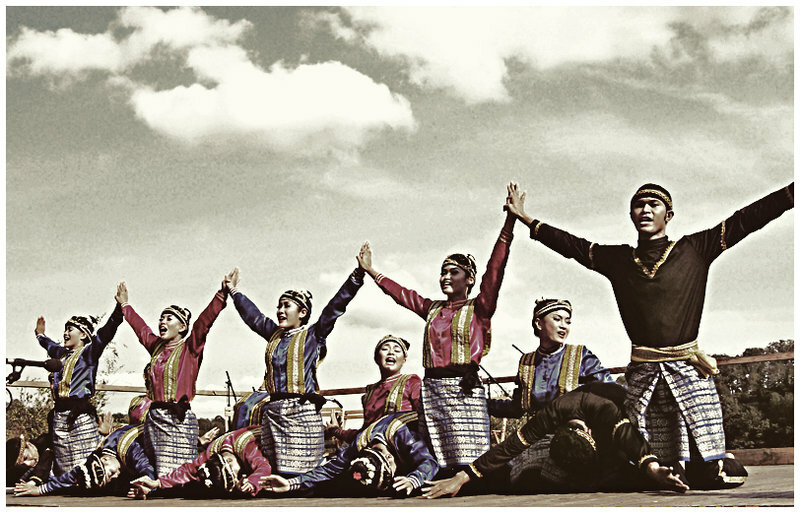 SAMAN (dance) is a style of dance from Indonesia that uses body percussion in a very subtle way. Generally, played by a large number of dancers, the smooth claps and slaps become louder for a bigger audience. the dance is presented with the dancers on their knees, and the percussion is made on the palms and backs of hands, thighs and chests. ROMANIAN DANCE (folk) is a dance that was originated mainly in the region of Transylvania during the period of feudalism. I small towns, the dance was developed as a community activity and the configuration of the dancers is usually worked in either a circle or pairs. Accompanied by musical instruments and singing, the most common body percussion in this style explores finger clicks, stomps, slaps on the feet, thighs and claps. GYPSY DANCE (Hungary and Slovakia) is a dance that comes from the same region of the Romanian Dance with common influences, but organized differently. the pace is very fast and the rhythmic phrases are quite complex. The body sounds are: hands, stomps, slaps on the feet, thighs and chest. KATHAK, which derives from the word “katha” is an original dance of northern India. This style of dance usually tells a story, for example, about Hindu mythology or stories about the famous Mahabharata and Purana Raymayana. The dance has quick movements and pirouettes, and also static positions. the dancers wear bells on the ankles, hit the floor with their feet and create rhythmic phrases that accompany the music cells being played by the musicians. CATIRA is a folk kind of dance in Brazil and it was originated by the mix of indigenous and European cultures during the process of colonization of Brazil. It works mainly with stomps and hand claps, being performed by men only.